Built with quality in mind, the American made Phoenix SD complete outdoor cooking system is easy enough for a beginner to use and has enough features for the serious griller. This grill is designed to let you do it all: grill, roast, steam and smoke. Each side of the stainless steel, oval-shaped dual burner is controlled individually and together provides up to 25,000 BTUs of precise heat. The solid brass dual valve allows you to adjust your grill as low as 250 degrees for slow cooking, or turn it up to 500 degrees for high heat grilling. The adjustable vents on the top of the grill allow you to maintain and control the air flow while cooking. For steaming, close the drain valve, fill the cast aluminum drip pan that sits above the burner with liquid of your choice and set the burner to high to steam vegetables or seafood. The heat rises around the drip pan, making it virtually free of flare-ups. With the electric ignition with stainless steel gas collector box, you can easily light the grill using one AAA battery. The stainless steel diamond pattern cooking mesh grid provides 400 square inches of cooking space and prevents food from falling through. The stainless steel grill head has a Sta-Kool swivel, stainless steel handle to open the lid safely and easily and the hood has stainless steel heat indicator to monitor temperatures. The black, powder coated cast aluminum patio base includes two stainless steel side shelves. Clean up is easy with the cast aluminum drip pan and collection bucket. Cooking Grid Dimensions 24 1/4 X 16 1/2"
Phoenix grills have a lifetime warranty on the grill top and bottom, control panel, stainless steel or aluminum column, deck/patio base, portable base, stainless steel shelf, stainless steel cooking grid and stainless steel fasteners. The stainless steel burner and cast aluminum drip pan are warranted for ten (10) years. The black aluminized grill top and bottom are warranted for five (5) years. All other components including the igniter system, gas valves and knobs are warranted for one (1) year. I've owned a Weber, Charbroil, and a Baker's Choice grill. In my opinion, the Phoenix grill beats them all. I love not having to monitor the grill for flare ups, because there isn't any. I can sit back and enjoy a beer and entertain guests without any worries. It's so versatile. I've steamed crab legs, roasted chickens, grilled steaks and vegetables, all with excellent results. It's so easy to use, my wife (who doesn't like cooking on a grill) has no problem at all using it. We use the grill a minimum of 3 times a week (even during the cold, Wisconsin winter). We love it! I bought the full stainless model after doing much research. Stainless reflects heat better. This grill is just fantastic, you cook by time and don't worry about your chicken catching on fire. And the way it cooks is great, I have never had chicken with such crispy skin, when the grease drips off the meat and hits the cooking plate it vaporizes and surrounds the meat in a hot mist, it is like deep frying and baking simultaneously. NY strips are the best and it does the best Salmon ever. I tried steaming with it and a dedicated steamer would be better. At $1000 I don't see the materials to warrant the price, but it cooks great. Weber will never be used again. plus you can cook/smoke roasts, turkeys etc. I love it. This grill can get hot but on a colder day is struggles to get to temp. The fire box is basically a sheet metal box so if your grill is hot the entire box is hot. To be expected on all grills. The problem with this grills design is that the box wraps around the front past the knobs so everything in that area is the same temp as the grill. The sheet metal extends over the top of the knobs so be careful turning the knobs or your knuckles will have second degree burns very quickly. I think this is a poor design and while grills are dangerous devices as they are, I think this one because of where the heat box is, create an additional hazard. I hate think what would happen if my grandson walked up and touched it. You should also be aware that as it is it will leave no grill marks. Basically, it is an exposed oven. 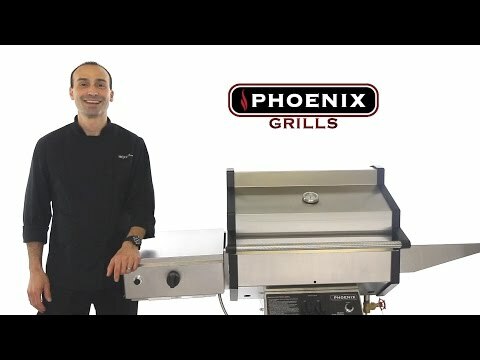 The unique Phoenix is a gas grill with a lot of cooking versatility. This grill is designed for people who want a simple but great cooking experience every time. Phoenix has an innovative cooking system that uses built-in drip pan for indirect cooking. If you’re looking to upgrade from charcoal or an inexpensive gas grill, Phoenix may be worth looking into. Phoenix grills are available on cart or with a patio base, and the cart comes in black or stainless finishes. Phoenix grills cook food differently from most gas grills. Phoenix utilizes indirect cooking, using a cast aluminum drip pan to shield the food from direct contact with the burners. As you’re cooking, juices from food drip down into the drip pan, sizzling and creating flavorful smoke. Any excess grease is directed into the collector bucket, eliminating flare-ups. The drip pan also adds cooking versatility to the grill. For example, you can fill the pan with water and steam food or fill it with wood chips and use it as a smoker. Most gas grills don’t offer this kind of versatility, unless you purchase extra add-ons. The best part about this cooking system is it produces great results without the need to constantly watch the food. Phoenix grills are made from a combination of cast aluminum and stainless steel. Cast aluminum is a good material because of its longevity and rust resistance. Phoenix also has a lifetime warranty on the grill body, and 10 years on burners and drip pan. Overall, Phoenix builds a quality grill with an affordable price. Phoenix doesn’t have a lot of grilling power, so you if you like searing steaks or seafood you might be disappointed with the results. The two burners have enough power to cook steak, but they won’t create those restaurant quality sear lines that everyone loves. The design of this grill is bare-bones. Phoenix doesn’t offer integrated lights, rotisserie, or searing burners. The cooking space is more compact when compared to most other grills in this price range, so if you need the ability to cook a lot of food at once you might want to consider a larger grill. 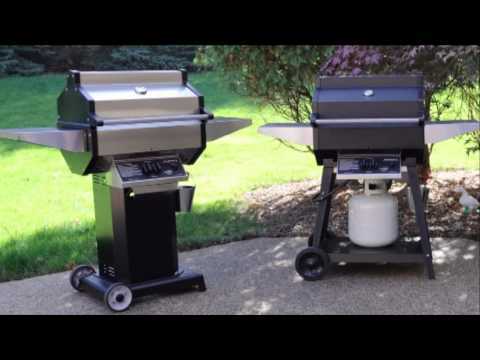 Primarily a gas grill company, Phoenix doesn’t have a wide range of outdoor kitchen products. If you’re building an outdoor kitchen, I suggest looking at other brands if you’d like matching components. 24 1/4 X 16 1/2" 25 1/2 X 17" 20 5/8 X 16" 25 1/2 X 17"
WARNING: These products may contain chemicals known to the State of California to cause cancer, birth defects or other reproductive harm. For more information about Proposition 65, please refer to the following website: oehha.ca.gov/proposition-65.